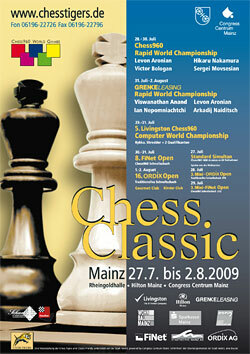 The 2009 Chess Classic will take place from July 27 to August 2 in the Rheingoldhalle of the Congress Centre, Hilton Hotel in Mainz, Germany. 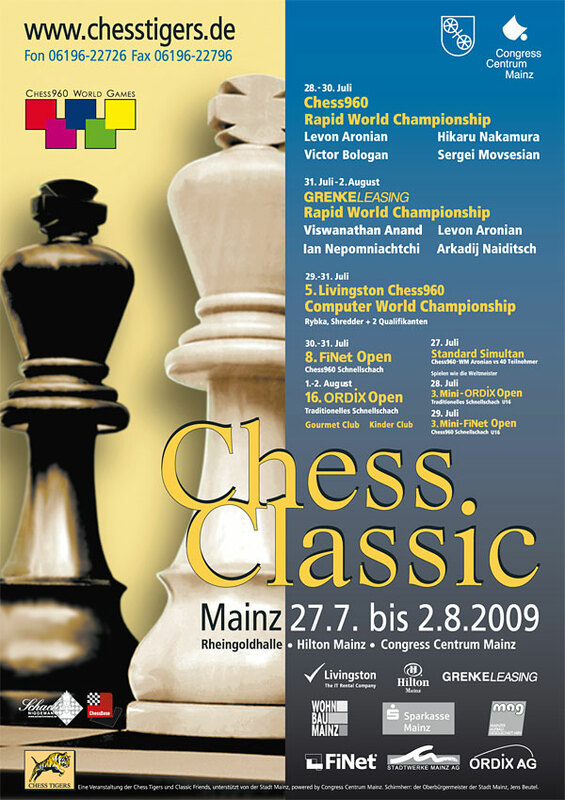 The event includes tournaments and Opens in traditional and Random Chess, with stars like the current World Champion Vishy Anand, Levon Aronian of Armenia, strong Russian junior GM Ian Nepomniachtchi and top German GM Arkadij Naiditsch. Schedule below. When Levon Aronian and Nakamura sat down to play the final of the Chess960 World Rapid Chess Championship it was difficult to name a clear favorite. In the preliminaries Aronian had dominated the first day, Nakamura the second. 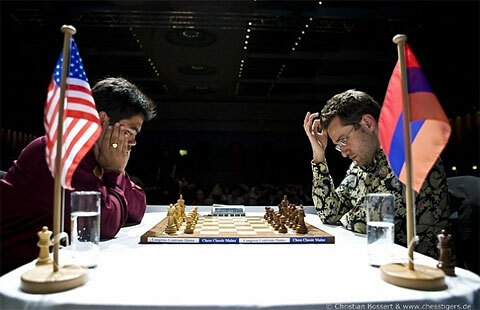 Both are known as extremely strong blitz and rapid players, and both had shown their Chess960 skills on more than one occasion. Taking this into account, the match was surprisingly one-sided. 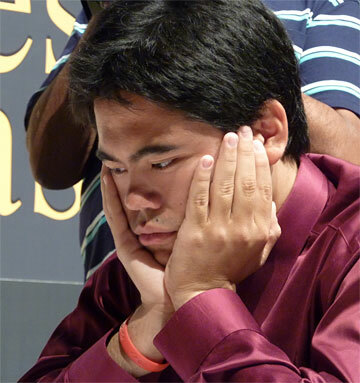 Nakamura simply won the first three games to become new World Champion – in a very convincing manner. In the first game Aronian opted with Black for an elastic, dynamic set-up. But when White managed to create weaknesses in Black’s camp, which he soon occupied with his pieces, Black seemed to be in trouble. In a bid for counterplay Aronian decided to give material but Nakamura defended coolly and sent his king from the queenside to the kingside, where it finally was safe. 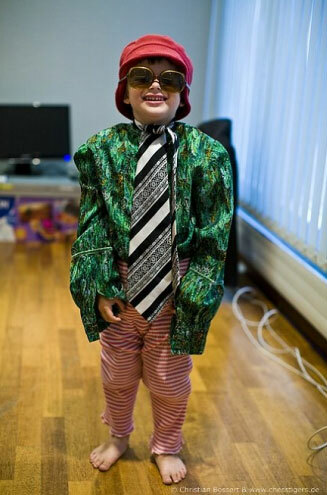 With his last swindling chances gone Aronian resigned. The game continued 26...e5 27.Bxd7 Nxd4 28.Rxd4 cxd4 29.Rxe5 Qa2+ 30.Kc1 Qa1+ 31.Kc2 d3+ 32.Kxd3 Qd1+ 33.Qd2 Bc4+ 34.Ke3 Qg1+ 35.Kf3 h5 36.Re1 Qc5 37.Be7 Bd5+ 38.Kg3 h4+ 39.Kh3 1-0. The first game in the fight for third place between Bologan and Movsesian took a different course. Here it was Bologan who pressed with White and advanced his pawns early on. However, this gave Black good counterchances. He forced an exchange of queens and attacked the weak white pawns afterwards. Bologan found no good way to defend them and soon had a lost position, which Movsesian converted into a full point. Inspired by this win Movsesian played a little brilliancy in the second game. Sacrificing an exchange, he pushed on the kingside, in the center and finally on the queenside, where he mated Black’s king. 21.Nf6 g4 22.Qf1 c6 23.Qe1 1-0. 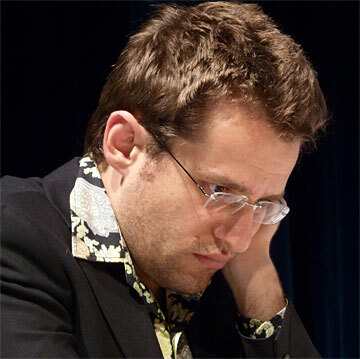 While Movsesian was brimming with confidence Aronian appeared shaken after his loss in the first game. At any rate, it hard to find another explanation for the blunder he committed in the second game against Nakamura: After to a relatively simple oversight Aronian lost knight and game. “Probably I had a bad day”, he commented wryly in the press conference. 19...Qc6+ 20.Qd5+ Qxd5+ 21.Rxd5 Rb7 22.Nxa6 Ra8 23.Nxb4 Bxb4 24.a4 Bc5 25.Re1 e6 26.Rd3 d5 0-1. With Nakamura and Movsesian both leading 2-0 the final seemed to come to a swift end. The match Aronian vs. Nakamura in fact ended quickly. To get back into the match Aronian used lots of time in the third game – time which he later lacked. He got lost in the middlegame complications and fell victim to a surprising attack by White. A convincing victory, which made Nakamura new Chess960 Rapid World Champion.The fourth game between Aronian and Nakamura was just a formal affair, and maybe it was the lack of tension which made Aronian spoil an advantageous position into a draw which led to a final result of 3.5:0.5 for Nakamura. Things went less smoothly for Movsesian. In the third round he was not able to cope with Bologan’s aggressive play and lost, which made the fourth game crucial. 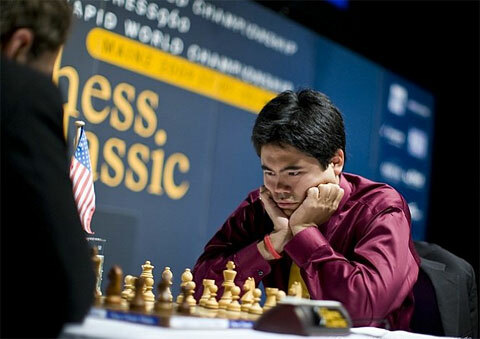 But Movsesian quickly recovered from the loss and played the fourth game in a very professional manner. Despite Bologan’s efforts to stir up trouble Movsesian managed to keep everything under control and steered the game into a completely drawn rook ending. After a couple of moves Bologan accepted the inevitable and agreed to a draw. 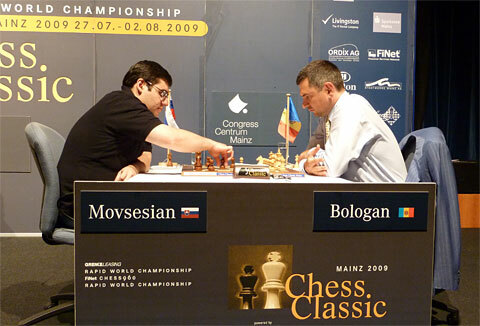 Movsesian thus won the match 2.5:1.5 and became third in the Chess960 Rapid World Championship. Tomorrow, in the GRENKE LEASING Rapid World Championship, where he will meet Vishy Anand, Arkadij Naiditsch and Ian Nepomniachtchi Aronian has a chance to show how Chess960 improved his classical chess vision. Eleven rounds Chess960 Rapid Chess, 20min/game + 5s/move. Thu 30 July: rounds 1-5; Fri 31 July: rounds 6-11. Start of rounds: Thu 12:00h and Fri 10:00h. Award Ceremony Fri 17:30h. Details. until Tue, July 28, 10:30h. Seven rounds: 11:00h, 12:00h, 13:00h, 14:00h, 15:00h, 16:00h, 17:00h. Award ceremony: 18:00h. Details. until Wed, July 29, 10:30h. Seven rounds: 11:00h, 12:00h, 13:00h, 14:00h, 15:00h, 16:00h, 17:00h. Award ceremony: 18:00h. Details. Rapid Chess, 20min/game + 5s/move. Course of events: Wed 30 July: first set of three rounds; Thurs 31 July: second set of three rounds; Fri 1 Aug.: four-game matches, big and small final possle tiebreak (5min/game + 5s/move). Start time of rounds: 11:00h, 12:30h, 14:00h, final additionally: 15:30 h, tiebreak: 17:00h. Participants: Rybka, Deep Shredder, plus two qualifiers. Details. 11/13/2018 – Tuesdays at 18:00 CEST (5:00 pm UK time, Noon EDT) Lawrence Trent brings you the latest trends, games and combinations from elite chess tournaments. Lawrence is on-demand this week and free for ChessBase Basic account holders for a limited time! (Why not <a href="https://account.chessbase.com/en/create-account">register for FREE in 30</a> seconds if you don't already have an account?) This week Lawrence covers the recently concluded rapid tournament as part of Tata Steel Chess India.